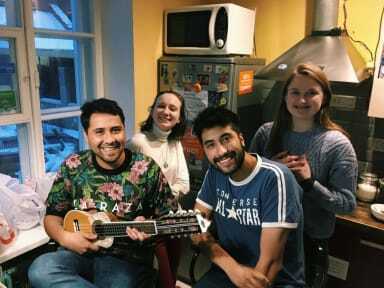 Trinity hostel is ideal for young people, solo travelers and everyone who likes fun parties and making new friends. Our rooms are all decorated in fun and original ways, ranging from those in Japanese style to traditional Belarusian ones. All the guests have access to the common kitchen that has a fridge, a microwave and a stove for your convenience. In our hostel, you’ll immediately feel yourself at home! It’s so impeccably clean here that most of our guests walk around barefoot or in comfy slippers, which you can buy right at the reception desk. One of the best features of our hostel is that here you’d have an opportunity to book one of the two most popular tours in Belarus: 1) Mir and Niasvizh Castles 2) Khatyn and Stalin Line. If you have some heavy luggage, feel exhausted, don’t want to get lost or simply enjoy comfort we can actually organize your transfer from and back to the airport. Do you like to party? Then you’re in the right place! We are the only hostel in Minsk that organizes a pub crawl, during which we’ll show you the best and trendiest bars in Minsk. Our pub crawl is not only an opportunity to enjoy Minsk nightlife but also a great chance to meet new people. The price is 17 euro. enter the gate with 'love locks' on it, go into the courtyard and up the stairs to the reception. Tolles Hostel mit nettem PErsonal, sauber und gemütlich. Könnte mir keinen optimaleren Platz in Kiew für ein Hostel denken NUR ZU EMPFEHLEN! Super freundliches Personal. Englisch kein Problem. Dank an die Mitarbeiter, die mir geholfen haben, mein Visum für Belarus zu bekommen. Sehr kleines Zimmer mit unbequemen Betten. Lage war ganz schön, direkt am Fluss und nahe einer Shoppingmall. In der Küche kam man leicht mit anderen Reisenden ins Gespräch. Beim Check-In muss man die Schuhe ausziehen, warum auch immer? !